One scholarship is awarded annually in the amount of $1,000.00. Funds will be delivered directly to the student’s Georgia State University Account in two parts: $500.00 in the fall semester and $500.00 in the spring. 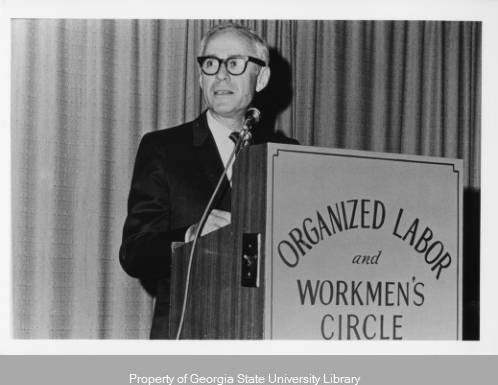 The scholarship is administered by the Southern Labor Archives. To be considered for the Jacobs Scholarship, the applicant must be admitted to or enrolled in GSU and be a student in good standing. Additionally, the applicant must also be a member of a Georgia AFL-CIO affiliate labor organization or the spouse, child, or grandchild of a member. Additionally, the applicant must submit a cover sheet, essay, and a copy of a GSU transcript, or, if not currently enrolled at GSU, a statement attesting to the fact that the student is admitted to GSU. Documents may be submitted electronically or via traditional mail by May 15, 2014. See the online application for more information. This entry was posted in For Graduate Students, For Students, General News, Special Collections & Archives, Uncategorized. Bookmark the permalink.